Ramp Supervisors typically oversee the work of the ramp agents in private, military and commercial airports. The Ramp Supervisor role entails the supervisor to perform duties such as – directing loading and unloading tasks, ensuring adherence to applicable aviation laws and regulations, managing the day-to-day cargo operations, overseeing the sorting of cargos, directing the handlers, ensuring execution of work, inspecting cargo and identifying hazardous goods to ensure that they are packed as per the hazardous material regulation policies. Ramp Supervisors require strong analytical and personnel management skills to execute work orders; excellent time management and planning skills are also expected for this post; Ramp Supervisor Resume have to depict strong computer skills and relevant cargo handling software; they should also have strong math proficiency to calculate load weight and capacities. 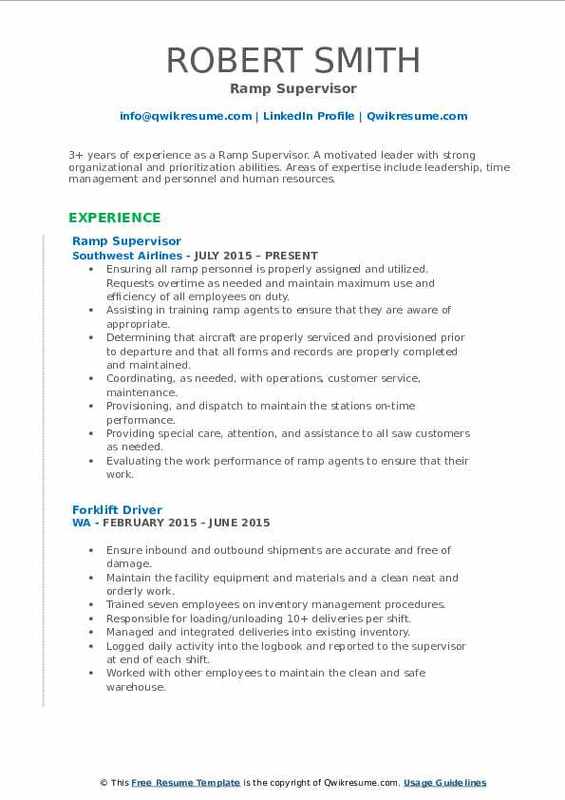 A formal training along with ramp agent expertise is commonly seen in most of the successful resumes. Objective : 2 years of experience as a Ramp Supervisor is now seeking to secure a job that has challenges and an opportunity for advancement. 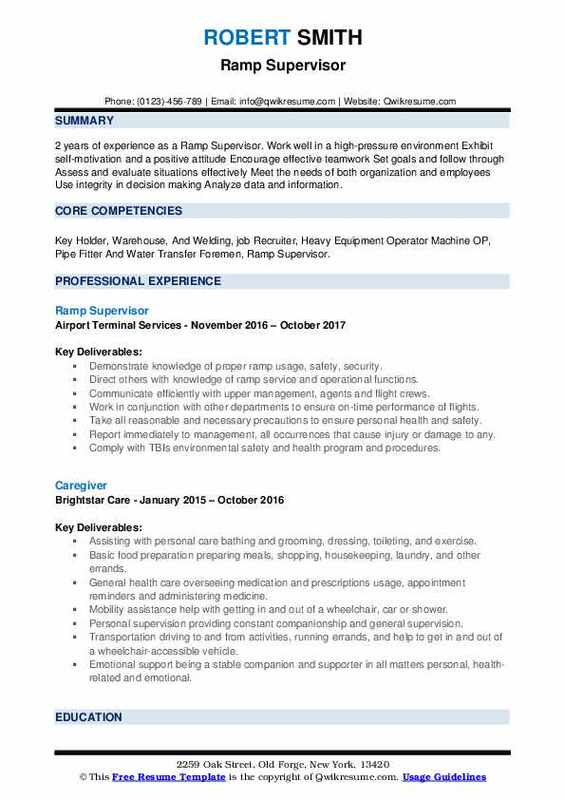 Skills : Forklift Operator, M985A4 W/ Crane, Basic Computer Knowledge, Basic First Aid Knowledge, And Inventory Management. Coach, mentor and counsel ramp agents to work together for the continuous development of a safe and successful ramp team. Oversee the maintenance of and strict adherence to shift schedules for respective personnel. Hold daily shift briefings to communicate pertinent information e.g., daily flight activity, irregular. Operations, crew assignments, new/changed SOPs, shift-swap rules, areas needing improvement. Monitor the teams' activities through visual inspections, quality assurance, and compliance checks. Ensure timely completion of assigned duties and report any deviations of procedures to management. Confer with management on workers performance appraisals and/or disciplinary actions. Ensure ramp agents are in compliance with uniform, appearance and personal protective. 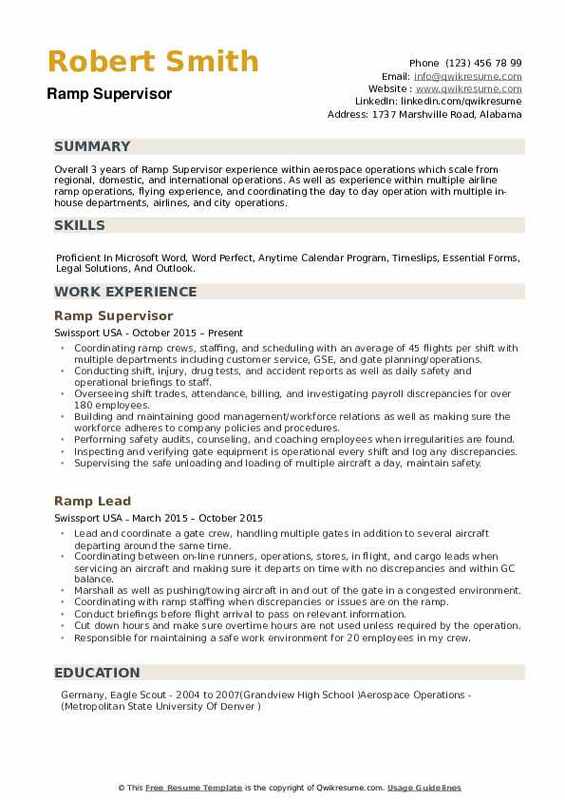 Objective : 2 years of experience as a Ramp Supervisor. Work well in a high-pressure environment Exhibit self-motivation and a positive attitude Encourage effective teamwork Set goals and follow through Assess and evaluate situations effectively Meet the needs of both organization and employees Use integrity in decision making Analyze data and information. Skills : Key Holder, Warehouse, And Welding, job Recruiter, Heavy Equipment Operator Machine OP, Pipe Fitter And Water Transfer Foremen, Ramp Supervisor. Demonstrate knowledge of proper ramp usage, safety, security. Direct others with knowledge of ramp service and operational functions. Communicate efficiently with upper management, agents and flight crews. Work in conjunction with other departments to ensure on-time performance of flights. Take all reasonable and necessary precautions to ensure personal health and safety. Report immediately to management, all occurrences that cause injury or damage to any. Comply with TBI's environmental safety and health program and procedures. Responsible for maintaining a safe work environment for 20 employees in my crew. Objective : Motivated Ramp Supervisor with One year of experience seeking to obtain a position in an established and professional environment that values superior customer service and a extensive experience in the security industry with opportunities to learn and grow within the company. 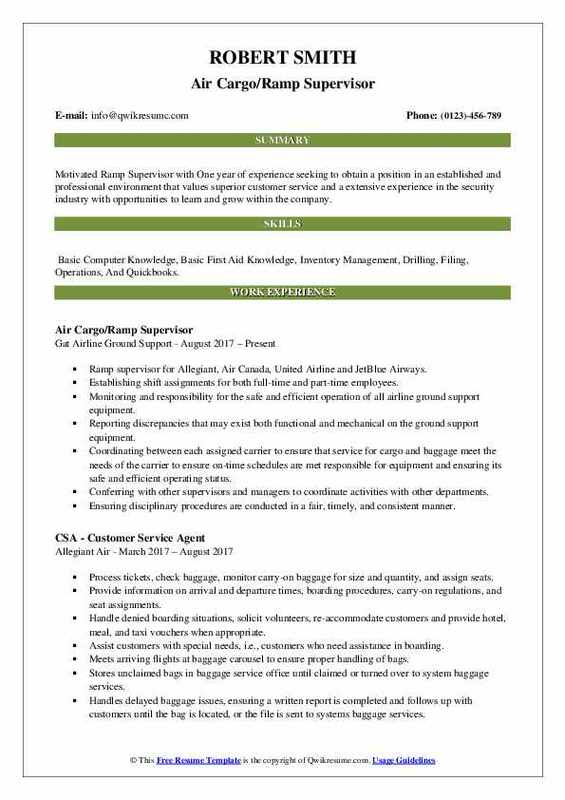 Skills : Basic Computer Knowledge, Basic First Aid Knowledge, Inventory Management, Drilling, Filing, Operations, And Quickbooks. Ramp supervisor for Allegiant, Air Canada, United Airline and JetBlue Airways. Establishing shift assignments for both full-time and part-time employees. Monitoring and responsibility for the safe and efficient operation of all airline ground support equipment. Reporting discrepancies that may exist both functional and mechanical on the ground support equipment. Coordinating between each assigned carrier to ensure that service for cargo and baggage meet the needs of the carrier to ensure on-time schedules are met responsible for equipment and ensuring its safe and efficient operating status. Conferring with other supervisors and managers to coordinate activities with other departments. Ensuring disciplinary procedures are conducted in a fair, timely, and consistent manner. Ensures necessary ground equipment is available in the ramp area and bag room for upcoming flights. 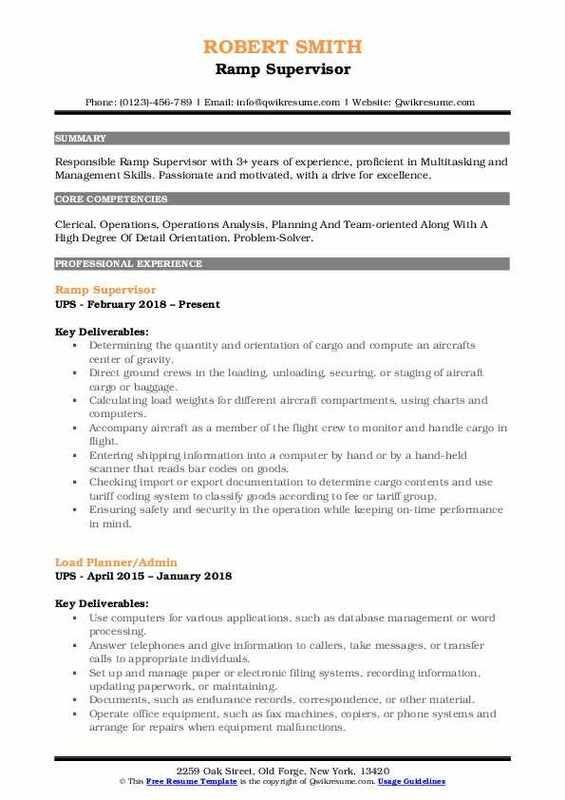 Objective : 3+ years of experience as a Ramp Supervisor. A motivated leader with strong organizational and prioritization abilities. Areas of expertise include leadership, time management and personnel and human resources. Skills : Customer Service, Forklift, Warehouse/Logistic Operations, Airline Operations, Healthcare, And Supervising. Ensuring all ramp personnel is properly assigned and utilized. Requests overtime as needed and maintain maximum use and efficiency of all employees on duty. Assisting in training ramp agents to ensure that they are aware of appropriate. Determining that aircraft are properly serviced and provisioned prior to departure and that all forms and records are properly completed and maintained. Coordinating, as needed, with operations, customer service, maintenance. Provisioning, and dispatch to maintain the stations' on-time performance. Providing special care, attention, and assistance to all saw customers as needed. Evaluating the work performance of ramp agents to ensure that their work. Monitoring the handling and operating condition of all ramp equipment and all other. 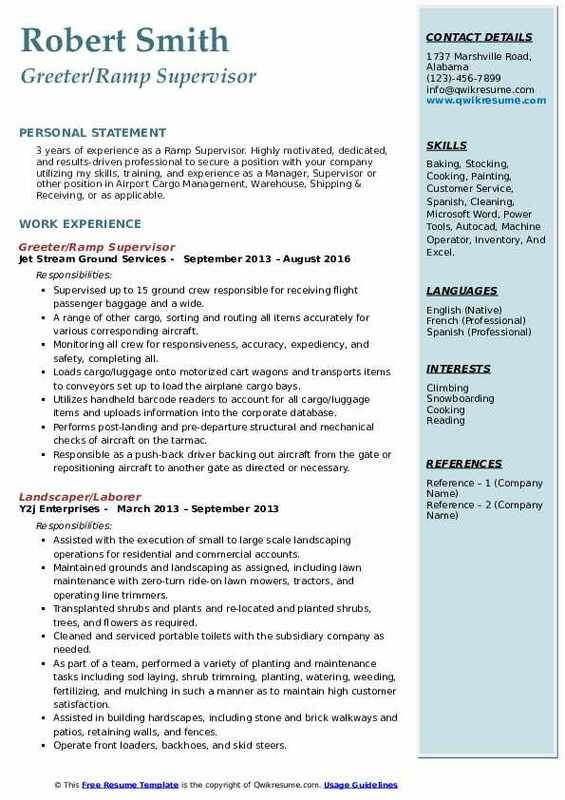 Objective : 3 years of experience as a Ramp Supervisor. 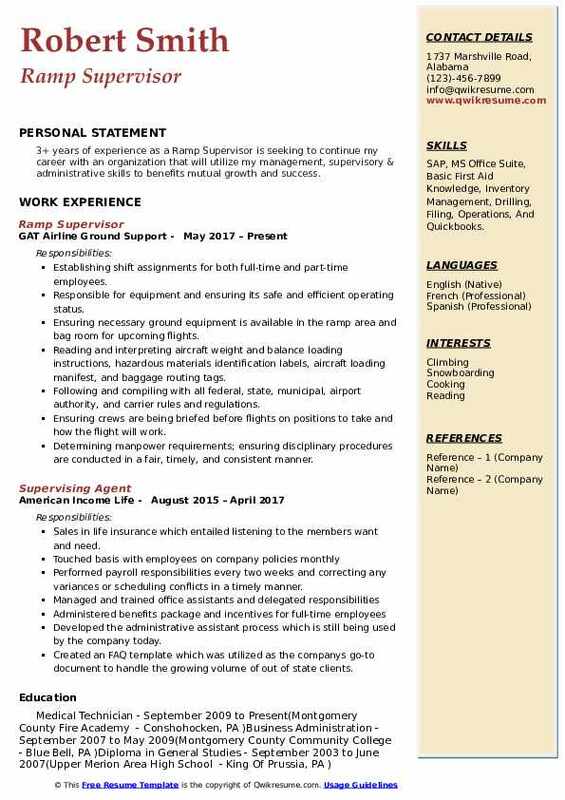 Highly motivated, dedicated, and results-driven professional to secure a position with your company utilizing my skills, training, and experience as a Manager, Supervisor or other position in Airport Cargo Management, Warehouse, Shipping & Receiving, or as applicable. Skills : Baking, Stocking, Cooking, Painting, Customer Service, Spanish, Cleaning, Microsoft Word, Power Tools, Autocad, Machine Operator, Inventory, And Excel. Supervised up to 15 ground crew responsible for receiving flight passenger baggage and a wide. A range of other cargo, sorting and routing all items accurately for various corresponding aircraft. Monitoring all crew for responsiveness, accuracy, expediency, and safety, completing all. Loads cargo/luggage onto motorized cart wagons and transports items to conveyors set up to load the airplane cargo bays. Utilizes handheld barcode readers to account for all cargo/luggage items and uploads information into the corporate database. Performs post-landing and pre-departure structural and mechanical checks of aircraft on the tarmac. Responsible as a push-back driver backing out aircraft from the gate or repositioning aircraft to another gate as directed or necessary. Starts up the APU (auxiliary power unit) to prime the other jet engines on the aircraft as well instrumentation, from the cockpit in preparation for departure. Promoted from bag room to ramp supervisor in just 2 months based upon work ethic, dedication. Summary : 16 years of experience as a Ramp Supervisor is now looking to obtain an employment and build a career in a company that consistently advances and sets the industry standard for performance with it's innovative, technical and state-of-the-art solutions. This company will also lead its industry with an unparalleled commitment to customer service. Skills : Warehouse And Welding, job Recruiter, Heavy Equipment Operator Machine OP, Pipe Fitter And Water Transfer Foremen, And Ramp Supervisor. Supervise 10 vendor employees and ensure proper methods and procedures are followed during PM Operation. Certified power industrial truck operator trainer for cargo tractor, aircraft tow tractor, cargo loader, de-ice truck, belt loader, and forklift. Responsible for accepting and tendering cargo for southwest airlines, US Airways, United Airlines and Delta Airlines. Proficient in each airline's respective system: southwest Catts; US Airways saber; United Unimatic and Delta web vision. Duties included constantly ensuring that deliveries were made on time and that a high level of customer satisfaction with both the product and service was maintained. Monitored the mickey stevens outdoor sports complex for all scheduled late afternoon and evening sports leagues; oversaw the public use of other sports facilities, i.e., Tennis and basketball courts. Rink guard for public skating programs and events responsible for checking and maintaining safe conditions on both the ice and the surrounding areas (walkway, bleachers, gates into and off the ice, etc.) repair other building facilities during down times. Proficient in the use of Microsoft word and excel as well as a variety of ups proprietary software programs that track shipping, aircraft and feeder scheduling and weight tracking. 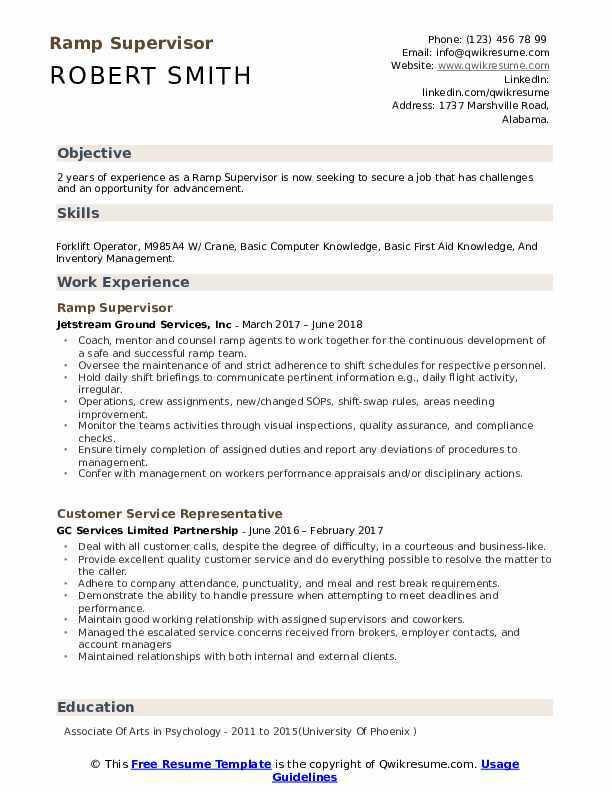 Headline : 6+ years of experience as a Ramp Supervisor is seeking to obtain a position that would secure a career within a company that has a high-tech, fast-paced and challenging environment where I can further my knowledge and the skills I have acquired from past and present job experiences that would allow me to be financially secure to support my family. 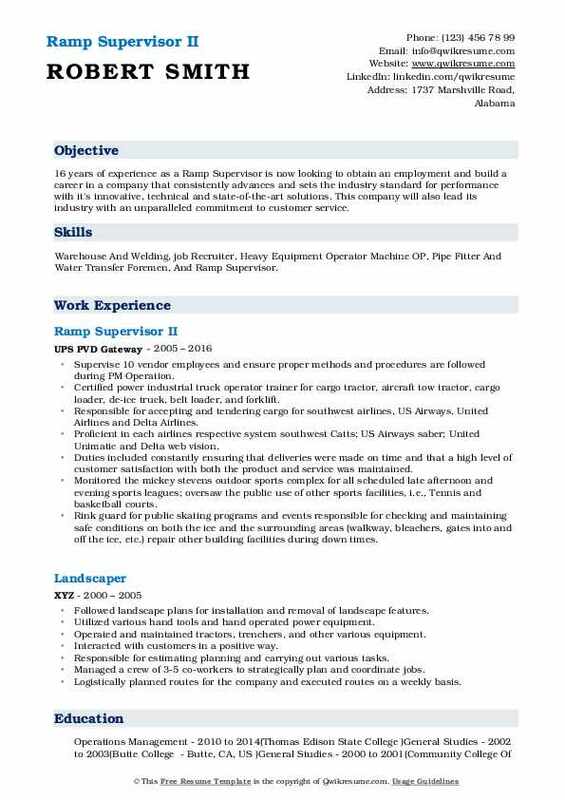 Skills : Heavy Equipment, Word, Driving Tanker Truck, Organizational, Moving Large Load, Management/supervising, Operate Large fast-paced, Inspection, And Preventative Maintenance. Preparing documentation for security, customer luggage claim times, cleaning audits, security search aircraft logs. Assisting agents with questions pertaining to daily, weekly, and monthly duties when needed. Answering multi-line phones, scheduled patient appointments, operate facsimile and copy machines. Assisting patients with care, take vital signs, prep for procedures and obtained specimen. Resolving inquiries on billing, credits/adjustments, and website information regarding cable service. Up-sale additional cable, internet, and phone service for existing and new customers. Assisting customers with technical issues regarding satellite, internet, and phone service, schedule service calls. Assisting service technicians with connectivity issues regarding customers equipment. 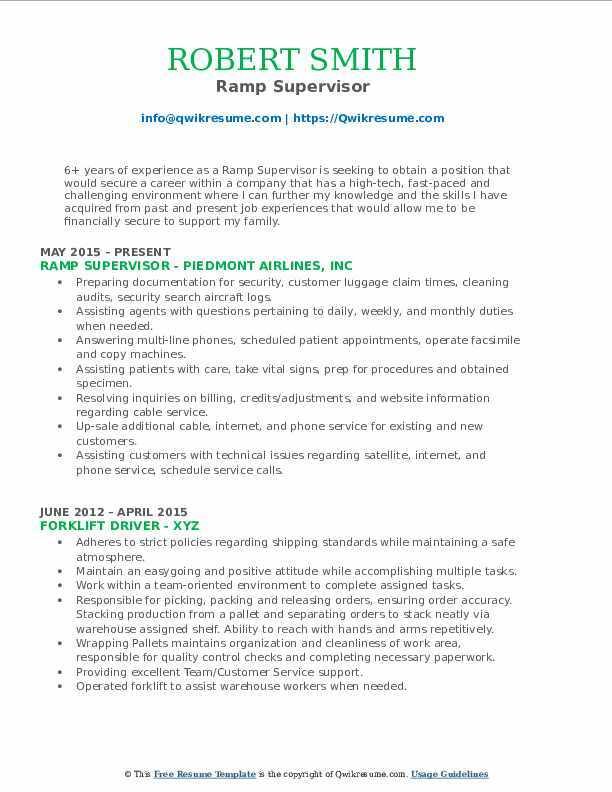 Objective : Responsible Ramp Supervisor with 3+ years of experience, proficient in Multitasking and Management Skills. Passionate and motivated, with a drive for excellence. Skills : Clerical, Operations, Operations Analysis, Planning And Team-oriented Along With A High Degree Of Detail Orientation, Problem-Solver. Determining the quantity and orientation of cargo and compute an aircraft's center of gravity. Calculating load weights for different aircraft compartments, using charts and computers. Entering shipping information into a computer by hand or by a hand-held scanner that reads bar codes on goods. Checking import or export documentation to determine cargo contents and use tariff coding system to classify goods according to fee or tariff group. Ensuring safety and security in the operation while keeping on-time performance in mind. Objective : 3+ years of experience as a Ramp Supervisor is seeking to continue my career with an organization that will utilize my management, supervisory & administrative skills to benefits mutual growth and success. Skills : SAP, MS Office Suite, Basic First Aid Knowledge, Inventory Management, Drilling, Filing, Operations, And Quickbooks. Responsible for equipment and ensuring its safe and efficient operating status. Ensuring necessary ground equipment is available in the ramp area and bag room for upcoming flights. Reading and interpreting aircraft weight and balance loading instructions, hazardous materials identification labels, aircraft loading manifest, and baggage routing tags. Following and compiling with all federal, state, municipal, airport authority, and carrier rules and regulations. Ensuring crews are being briefed before flights on positions to take and how the flight will work. Determining manpower requirements; ensuring disciplinary procedures are conducted in a fair, timely, and consistent manner. Objective : Overall 3 years of Ramp Supervisor experience within aerospace operations which scale from regional, domestic, and international operations. As well as experience within multiple airline ramp operations, flying experience, and coordinating the day to day operation with multiple in-house departments, airlines, and city operations. Skills : Proficient In Microsoft Word, Word Perfect, Anytime Calendar Program, Timeslips, Essential Forms, Legal Solutions, And Outlook. Coordinating ramp crews, staffing, and scheduling with an average of 45 flights per shift with multiple departments including customer service, GSE, and gate planning/operations. Conducting shift, injury, drug tests, and accident reports as well as daily safety and operational briefings to staff. Overseeing shift trades, attendance, billing, and investigating payroll discrepancies for over 180 employees. Building and maintaining good management/workforce relations as well as making sure the workforce adheres to company policies and procedures. Performing safety audits, counseling, and coaching employees when irregularities are found. Inspecting and verifying gate equipment is operational every shift and log any discrepancies. Supervising the safe unloading and loading of multiple aircraft a day, maintain safety.